Join the adventure! » Login here. Please choose your preferred deck A - E. Available cabins will be listed. Click on a cabin to see Pictures, information and to find the price pr. person and a total price for this cabin. You can book as many cabins as you want in one order. It is allowed to not fill a cabin - however note that if you book a cabin with empty beds, you will be charged a fee for each bed not in use. We are sold out for single cabins. Please contact us to be put on a waiting list. If you want to share a cabin, we can arrange it! (Deck A) Click on a cabin to see its info and a booking link. Double inside with bunk beds. Trippel inside - sold as double cabin. Cabins are booked one at a time, and you can book as many as you want in a single order. Once you have booked a cabin you can choose to come back to this screen and book a new cabin. Click to read more about payment and cancellation policy. (Deck B) Click on a cabin to see its info and a booking link. (Deck C) Click on a cabin to see its info and a booking link. (Deck D) Click on a cabin to see its info and a booking link. 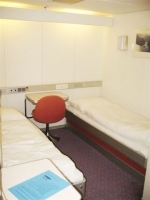 These cabins are situated inside the ship and there is no window to the outside world. This can be good and bad: good thing; you will get it dark at night, with a window you will get light from the bright summer night shining through the window. The bad: you don't have a view. Beds in this cabin category is situated on floor level. Bathroom with shower and toilet. Most of these cabins is quite spacious. Many prefer this type of cabin due to the fact that most of them are in the centerline of the ship. Which means less movement at sea. Also we are pretty sure you will not spend much time in your cabin - too much to do and see! Pictures from 526 and 403. SORRY! This cabin is already booked! (Deck F) Click on a cabin to see its info and a booking link. (Deck G) Click on a cabin to see its info and a booking link. (Important changes from the printed version: Bhin Pho will not participate since he passed away in 2017. RIP. Rune Hjelen will not be onboard (new job), and Stig Reitan from Tormek will not be onboard (new job). Mark Sfirri is a new demonstrator - read more about him on this webpage. Here you can enjoy a virtual trip on board the MS GANN! Visit decks area, cabins, restuarant, machine room and much more.